The beautiful city of Oxford; a place known for its elegant architecture, its heritage in higher education…and, Inspector Morse…yes as far as things go, you couldn’t possibly get any more middle-to-upper-class English than how we perceive Oxford. However, according to HELL’S GAZELLES front-man Cole Bryant, Oxford has a rich underground culture of alternative rock, metal and punk, with an array of undiscovered bands waiting for that opportunity to make their big break in the UK market. 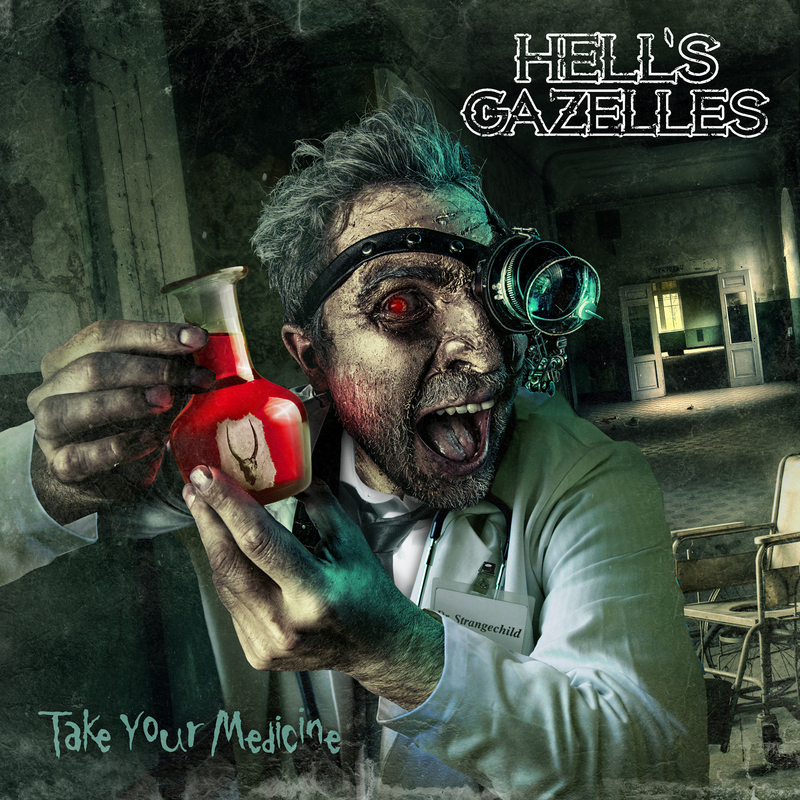 The Gazelles themselves (Completed by guitarist Nath Digman, bassist Rik Ridemark and drummer Luke Evans) are preparing to release their brand new EP “Take Your Medicine” which is due to drop July 27th…produced by Neil Kennedy who’s worked with CREEPER, these rocking springboks hope to medicate the masses with this latest batch of songs…but like Morse, will they endeavour enough to succeed? The EP opens up with “Give Me Something” and what WE’RE given is an instant, intense dose of no-nonsense hard rock; up-tempo with riffs equal parts slick and sleazy, you can feel the 80’s metal influence and attitude meeting the modern production values, and this is reinforced by the genuinely surprising vocals. Aside from the backing gang-vocal harmonies, there are moments here where Cole goes full on Vince Neil in places…it adds an extra dynamic, coupled with the simple yet effective guitar solo we’ve got a decent opener here. Speaking of Vince, follow up track “Stone Cold” initially incorporates subtle MOTLEY CRUE influences stylistically, the guitar work here especially carrying the song forward with some fuzzy bass thrown in for good measure, it’s fine if not a touch generic in places. Even the art work I have to point out, the mad scientist looking fellow is named Dr Strangechild, clearly a nod to Dr. Feelgood musically but also Dr Strangelove satirically…they really are wearing their influences on their sleeves here. “Out Of Time” then slows things down a little with a bass-driven, groove-heavy little piece…it’s a far moodier track and occasionally dips it’s toes in nu-metal territory with the guitar tone being just that touch deeper, although the inclusion of another solo spices the track up a bit, one thing I will say about Nath is that he’s partial to a spot of fret-wankery…the title track then revisits the classic metal sound that these lads clearly have a passion for and in ways they pay homage to the NWOBHM heydays, with the likes of SAXON and IRON MAIDEN layered through the track as clear inspirations, just with a little more youthful vigour, before closing track “She Devil” wraps things up with another fairly generic slab of blues-based hard rock, rounding the EP off pretty safely instead of going out with a bang or on an emotional level warranting repeat listens. If you’re a fan of hard rock and appreciate the nuances of this classic style then you’ll certainly tip your hat to these lad’s efforts, for the five tracks on offer here have been delivered well, but with a lot of bands that are popping for nostalgia these days, opting for the old-school, it CAN sound a little rinse and repeat. Musically fine but, not entirely memorable.